Love film, awesome music, eccentric art and local farm-to-table food? How about a weekend handed over to you to celebrate them all at the 2012 Indie Grits Festival? Here&apos;s your opportunity! 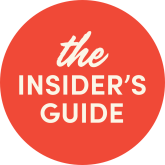 The Indie Grits Festival, created and presented by the Nickelodeon Theatre (South Carolina&apos;s only non-profit art-house theatre), was named one of the world&apos;s 20 coolest film festivals by Movie Maker magazine in 2010. Now in its sixth year, The Indie Grits Festival has expanded dramatically and will be held all over the Columbia region April 19 through 29, 2012. The festival will span 11 days of film while the festival umbrella covers a killer array of arts and culture partners in Columbia, including Cinemovements with Morihiko and the South Carolina Philharmonic, the ConvergeSE interactive conference, 701 Center for Contemporary Art&apos;s Columbia Open Studios tour, the Spork in Hand Puppet Slam, Crafty Feast Indie Craft Fair, and Columbia&apos;s top farm-to-table chefs and restaurants at Slow Food Columbia. 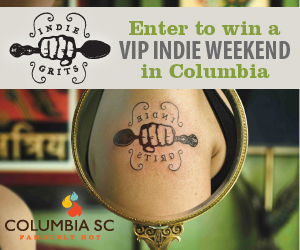 This year - in partnership with Indie Grits, the Nickelodeon Theatre and 701 Center for Contemporary Art - we&apos;re offering you the opportunity to win a trip to join in on the Indie Grits fun in its opening weekend, April 20-22, with A VIP Indie Weekend! You could win a weekend stay for you and one other at the Sheraton Columbia Downtown Hotel, tickets to Indie Grits film screenings, The Olivia Tremor Control show at New Brookland Tavern, Spork in Hand Puppet Slam, Slow Food Columbia, a personal concierge service for 701 CCA Columbia Open Studios, $100 to Motor Supply Co. Bistro, $50 to The Whig Pub, 1-year memberships to The Nickelodeon and 701 Center for Contemporary Art, Famously Hot t-shirts. View the full sweepstakes details and enter to win on Facebook, Twitter or online. For more information about the exciting, jam-packed 11 days of the Indie Grits Festival, visit the official Indie Grits website or view the 701 CCA Open Studios guide or map of the participating artists. Sold on the idea already? Go ahead and purchase tickets, and book your hotel at the Indie Grits host hotel, Columbia Marriott Hotel with a special Indie Grits rate code. Stay up to date with Indie Grits on Facebook and Twitter.